Peter Hean, a wright, married Elizabeth Small and had eight children. 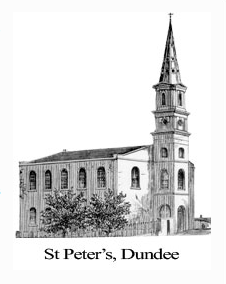 He and his brothers were responsible for the construction of several of Dundee's buildings, including the erection of St Peter's Church. He was involved with several groups and organisations. Peter Hean was assumed into the building trade through the business which belonged to his father, David Hean. In 1824, 'David Hean & Sons' operated from premises in Barrack Street. Towards the end of the 1820s, their business was listed as having been in William Street (north), before moving to a more permanent location of North Lindsay Street (east) in the early 1830s. Peter and his older brother Alexander were 'wrights' to trade, (as was their father) while his brother David was a 'mason.' Together, the three brothers continued to operate a successful wrights, building and contractors concern, titled 'David Hean & Sons,' continuing after the death of their father in 1843. It was reported that 'David Hean & Sons' was well known in the building trade of Dundee. The firm was reputed to have built many of the Free Churches in the district, with St Peter's Church (1836) in particular, having been attributed to Hean Brothers. At the time of pledging his subscription towards the building of the Albert Institute, Peter Hean had been retired from the family business for approximately 12 years. Peter Hean’s Wife, Elizabeth Small, was a daughter of James Small, a manufacturer (sailcloth) of Small’s Wynd. The firm of ‘David Hean & Sons’ was credited with having built the original, timber railway bridge at Perth, together with several buildings in Reform Street and Lindsay Street in Dundee. The building of St Peter’s Church in St Peter’s Street, the Church Hall and Church Officer’s House in 1836 was also attributed to the Hean brothers.. St Peter’s was noted to have been ‘remarkably douce for a Revivalist Kirk – yet this was the seat of the Reverend Robert McCheyne, a major player in the Evangelical revival who made the rafters ring.’ The following year, in 1837, the Hean Brothers tackled the building of St Aidan’s Church in Broughty Ferry. It was reported that ‘during the time they carried on business, they enjoyed so much prosperity that he (Peter) and older brother (Alexander) were able to retire not long after the death of their father.’ Alexander and Peter Hean retired from the building and contracting business in which they were involved by 1850/51. Their younger brother David carried on for a spell thereafter. At the time of his death, Peter Hean owned 3 shares of the Albert Institute (Ltd) – Numbers 780-782, valued at £3. He also owned a considerable number of properties in Reform, Crichton, Lindsay and Willison Street and others in Small’s Lane, Small’s Wynd and Candle Lane. A man declared to have been of ‘indomitable perseverance, remarkable energy with foresight, sagacity and clearness of judgement,’ Peter Hean eventually succumbed to complications as a consequence of a severe cold, contracted after an International Flower Show, in September 1876. Mitchell, Alison. (ed). Monumental Inscriptions pre 1855. Volume 4. (1995). The Scottish Genealogy Society. Statutory Registers. Dundee. Deaths. (1877). 282/ 3 274. ScotlandsPeople website. Old Parish Registers. Dundee. Marriages. (1826). 282/ 210 192. ScotlandsPeople website. Dundee Post Office Directories, 1824-1847. Dundee Central Libraries, Local Studies. Dundee Post Office Directory, 1850. p.109. Dundee Central Library, Local Studies. Dundee Post Office Directory, 1856-57. p.100. Dundee Central Library, Local Studies. Dundee Courier, 16 June 1877. p.2. Findmypast website. Dundee Directory, 1834, p.117. Dundee Central Library, Local Studies. Dundee Post Office Directory, 1861-62. p.1. Dundee Central Library, Local Studies. Dundee Post Office Directory, 1856-57. pp.6; 13; 21; 232. Dundee Central Library, local Studies. Dundee Post Office Directory, 1853-54. pp.58; 64; 70; 79. Dundee Central Library, Local Studies. Dundee Post Office Directory, 1850. pp.3; 15. 22; 27; 258. Dundee Central Library, Local Studies. Dundee Courier, 24 November 1846. p.3. British Newspaper Archive website. Dundee Directory, 1842-43. pp.95. 119. Dundee Central Library, Local Studies. Dundee Post Office Directory. 1837-38. p.34. DundeeCentral Library, Local Studies. Dundee Post Office Directory, 1824-25. p.123. Dundee Central Library, Local Studies. Dundee Post Office Directory, 1828-29. p.28. Dundee Central Library, Local Studies. Dundee Post Office Directory, 1829-30. p.28. Dundee Central Library, Local Studies. Dundee Post Office Directory, 1834. p.22. Dundee Central Library, Local Studies. McKean, Charles & Walker, David. (1993). Dundee: An Illustrated Architectural Guide. p.86. Royal Incorporation Of Architects in Scotland. Legal Records. Wills and Testaments. Dundee Sheriff Court. (1841). SC45/ 31/ 6. ScotlandsPeople website. Map. Ordnance Survey. Large Scale town Plan (Dundee). 1857-58. National Library of Scotland website. Scottish Dictionary of Architects. Architect Biography Report. The information above about Peter Hean has been collated from a range of digital and hard copy sources. To the best of our knowledge it is correct but if you are relying on any information from our website for the purpose of your own research we would advise you to follow up the sources to your own satisfaction. If you are aware of an inaccuracy in our text please do not hesitate to notify us through our Contact page.